In TRAVEL TIPS, Traveling with kids by Jurga LAST UPDATED: January 28, 2019 This post may contain affiliate links, which means that we may receive a small commission, at no cost to you, if you make a purchase through a link. More info: Disclosure. Are you at your wits’ end on how to survive traveling with young children, more particularly toddlers in car? This article is for you! If there is one thing that we quickly learned when road-tripping with kids is that children need space. Young kids also need constant entertainment and are simply not capable to remain quiet when sitting in a car for hours in a row… There is no way around this, so you have to accept it. Which doesn’t mean that you cannot do something that would make your family road trips more pleasant for everyone involved: your kids, your partner, and yourself. I have to admit that we still haven’t found one secret formula to traveling with kids in a car that works all the time. Having said this, let me share a few time-tested tips for traveling with kids in a car that helped us time and again. Most of these tips are applicable not just for toddlers and young children, but for older kids as well. However, toddler years are definitely the hardest, so I’ll focus on that. Find out! I guess I don’t have to tell you that you have to use right car seats for your children or that you have to check that your car is in order before you set in a road trip with kids. This article is not about that. Instead, it’s about all the hacks for traveling with kids, in particularly toddlers, in a car that will help you survive the long car rides. Below are our 9 essential tips for traveling with young kids and toddlers in a car. Read on! 1. Traveling with more than one child in the car? Separate the kids! One of the biggest challenges when traveling with kids in a car is that they start to fight. You hardly leave your street and they are already complaining about each other… By the time you reach the highway and cannot just stop anywhere, they are fighting… There is just one way to prevent this from happening and that is to separate the kids. If your car is big enough, make sure that the kids sit as far from each other as possible. There are many advantages of going to sit in the back between your kids. You can interact with them, point out some interesting things on the road, play a game, read a map together, or simply let them lean against you if they want to sleep. However, I understand that it’s not always possible and definitely not a viable solution when you are the only adult when driving with kids. In any case, do whatever is possible to have the kids sitting as far from each other as you can. When our kids were little, driving at night was the only way to survive the really long drives. We don’t do it now anymore (must be getting old), but it was a real life-saver when they were toddlers. I don’t encourage you to do this often, driving at night must be your last resort. If you are not comfortable to drive at night, then don’t. It’s also not a viable solution if you are making a long road trip – after all, you can’t do sightseeing during the day and then drive the whole night long. Sleep is extremely important, not just for your kids, but for you as well. However, if you are going on a family holiday that requires a 10-hour drive from point A to point B, you are well rested before your trip, and have at least two people who can take driving shifts, it’s really worth considering to drive at night. There are usually no traffic jams or road works at night, which usually means that you’ll reach your destination faster. On top of that, you don’t have to take pit stops for kids, as they’ll usually sleep through the night. If you are not comfortable with driving at night, a better option might be to leave really early in the morning, around 3-4 AM (just make sure you get enough sleep before you leave!). That way, you can cover a big distance before the kids will wake up without feeling completely exhausted yourself. We have made so many road trips with our children over the years. Our twins had just turned 2 when we visited South Africa, a year later we made a 5-week road trip in Australia, and then that same year we also made a 4-week road trip in Namibia… One thing we learned when road-tripping with toddlers is that it’s crucial to plan your trip itinerary with kids in mind. Here are a few examples. If you have a long drive ahead, it’s best to leave really early in the morning. Wake your kids just before you leave, make sure they go to the bathroom, and then leave immediately. With a bit of luck, they will sleep further in the car. Even if they won’t sleep, it will take them some time to properly wake up. They can then quietly have breakfast that you packed and, before you know it, you’re two hours further without them even realizing it. If you are on a road trip, try to visit some place nearby first thing in the morning. Ideally, it’s not further than 1 hour driving distance from your hotel, so that the first stretch of the trip will not be too long. After your visit, the kids will have moved a bit and will be more willing to rest. Once again, they can have a picnic lunch in the car, which will save you time and will make the drive look shorter. Also, early afternoon is perfect for driving longer distances with toddlers, because it’s usually their nap time. Ideally you don’t plan any road trip stops during your kids napping time or you risk having to wake them up, which means you’ll have to deal with grumpy child for the rest of the day… At the same time, you have to make sure that you are flexible enough to make stops when your kids are awake, which brings us to the next point. Sitting in the car for a long time is hard for everyone, but it’s simply impossible for toddlers. No matter how much you try telling them that you’ll reach your destination so much quicker if you can just drive without having to stop, young kids just have to be able to move. So even if it’s very tempting to drive straight to your destination, you really should try to plan a couple of short stops along the way. Make sure to stop at the places where kids can move. A playground is perfect for smaller kids; a short hike or a picnic will suit children of any age. Don’t expect to just find places like that as you go – you really should do some research upfront. Look for parks, playgrounds, quirky roadside attractions – anything that can break the drive without taking too much time. If there are no exciting short stops along the road, think of taking a ball with you – there is always some place where you can play ball for a couple of minutes. You’ll be surprised at how much effect a short stop like this can have on your children. Young kids might even get tired enough to take a short nap afterwards, which is always a huge relief when traveling in a car with toddlers. What we usually do is take fruit that isn’t messy, e.g. apples, grapes, bananas, or mandarins. Our kids also love raw veggies; especially carrots are perfect since they keep young kids busy for a long, long time… Dried fruit is also great to have when traveling in a car with kids. We also always have reusable water bottles in a car, one per person. For toddlers I recommend BPA-free reusable water bottles that won’t easily spill . Do yourself a favor and avoid any sweet and sticky drinks in the car as well! There are so many road trip games that you can buy. I’m not an expert as there are so many of them, but I know that Travel Scavenger Hunt Games always do well with kids. Alternatively, you can also get a book full of ideas for road-trip games and activities for kids . To tell you the truth, we always try to pack light (here you can find our family road trip packing essentials), so we don’t take that many games or toys when traveling with kids in a car. One game per child is our absolute maximum and they can take turns at which one they play. I love SmartGames for 1 person – they are small to pack, keep the kids busy, and there is no reason to fight when you are playing on your own. When we drive just short distances, it’s also easy to keep the kids busy by asking them to look for a car, a truck, a bus, a house… However, when driving for a longer time, it’s so nice to have at least a few minutes for yourself. That’s why I started making road trip bingo printables for our road trips… Road trip bingo is such a great way to keep children busy for a long time! If you are interested, you can download a few road trip bingos that I made for our kids for our American road trip. I printed many copies that we could use every day of the trip. All three kids loved looking for all kinds of objects along the road. Not only did it keep them busy for hours every day, it also made the long rides so much more pleasant for all of us. TIP: Make sure you take a pen with you or your bingo will be quite useless. To tell you the truth, we never used pens or markers on the road when our kids were little. We always packed crayons for our kids, but we quickly discovered the advantages of twistable crayons . In fact, there are so many reasons why twistable crayons should always be in your bag when traveling with toddlers… If you don’t have them yet, give it a try – it will change your life! If you don’t have the time to make a road trip bingo yourself, you can get these fun travel bingo cards from Regal . Also, fill in the form below and you can download our custom-made American road trip bing cards right away! Going on a road trip with your family? 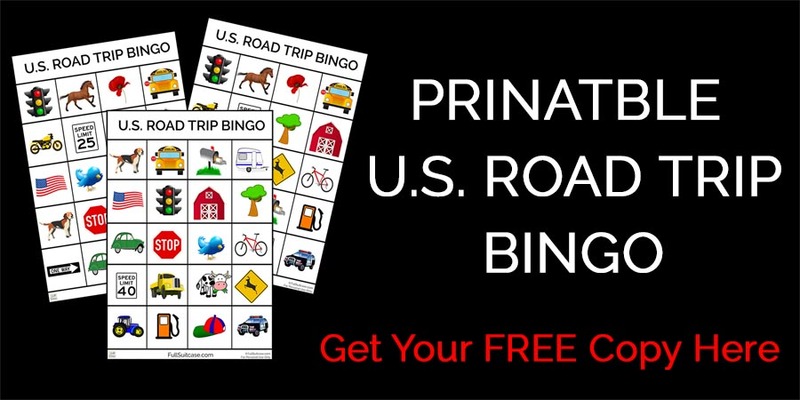 Sign up for Full Suitcase newsletter and you can download our custom-made Printable USA Road Trip Bingo right away. Because it’s the best way to keep your children quiet and entertained on a long car ride! YES, I want to enjoy my road trip! When you are embarking on a really long drive with kids, sometimes snacks and road games are simply not enough. After all, most of the activities mentioned above require at least some involvement from a parent, and it’s just not always possible. When traveling with toddlers in a car, we found that when everything else fails, music and audio books do wonders. I remember that we were so impressed with the effect it had on our kids that I even wrote a blog post about this magical solution to keep kids quiet in the car during very long rides. The choice of music, audio books, or cds with kids fairy takes will of course depend on your kids age, but I’m sure you already have some cd’s or mp3 files that your kids love. If you don’t, check this huge selection of children’s audio books on Amazon and you’ll have plenty of choice for any age. Put on your kids’ favorite music or stories and it will keep them quiet for hours… When traveling with toddlers, be prepared to sacrifice as they’ll often want to listen to the same song or story five times in a row. Even then, I find it totally worth it as it helps to survive the long drives with kids and stay sane. Music and stories do wonders for us every time. Repertoire has changed during the years, but it’s still our favorite way to entertain our kids in the car when we are all too tired for all the rest. The last resort when traveling with toddlers in a car is to switch on a movie or let them play games on a tablet. I know that many parents use this as first and only way to entertain their children and I certainly understand that it’s very tempting at times. However, we find that too much screen time has negative effect on our kids’ behavior, their interest in places that we visit along the way, and their ability to keep themselves entertained without the screen… I find that the children (and the parents) enjoy a road trip much more if they are more involved and aware of the surroundings, instead of looking at a screen the whole time. However, as a mom of three, I can tell you that there are times when you’d do pretty much anything just to make sure that everyone survives the long drive in a car. Anyhow, watching a movie in the car is always a huge hit with our kids. If your car doesn’t have built-in screens, you can use a portable DVD player or a tablet, and it will sure keep your kids quiet. Well, at least for the duration of the film or a game, because afterwards they might be quite agitated from all the impressions from the screen. I want to add a few more tips for traveling in a car with kids. One of the most important tip is to pack smart. Road games, crayons, snacks, audio books – make sure you have everything you might need during the car ride within an easy reach. It also helps to know where a spare set of clothes is located, so that you don’t have to unload the whole car in case of a little accident. Toilet paper and/or wet napkins. Extra diapers (if still using them), a potty (if traveling during the potty-training stage), or a travel toilet seat if your kids are really young. Your kids’ favorite cuddly toy. So, these are our main tips for surviving long car trips with toddlers and young children. Do you have any questions or want to share your hacks for traveling with toddlers and young kids by car? Feel free to leave a reply below.